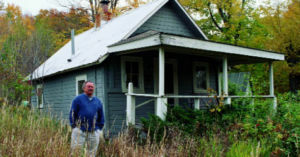 This essay by renowned Michigan author Jim Harrison was originally published in the January 2002 issue of Traverse, Northern Michigan’s Magazine. He wrote it shortly before his move to Montana. It seems I am asked several times a day whenever I leave our Leelanau County property just why we are trying to sell our farm and move to Montana. This is natural enough, as my not very pretty brown face has become rather familiar after 35 years in Leelanau County. The only immediately suitable or acceptable answer that I’ve discovered is, “That’s where our two daughters and grandchildren live.” Everyone seems to understand this, though it has become apparent that my answer conceals a specific amount of pain, an emptiness or vacuum that will present plenty of room for future homesickness. The fact is that this is natural pain after living in Michigan for 63 years. By my own reticence, perhaps fear, the withdrawal won’t be complete. My business address will still be Leelanau County where my aide of over 20 years, Joyce Bahle, will continue to gracefully run nearly all of my life except the writing, hunting, and fishing. I’ll be a frequent visitor here and I also can’t bear to sell my relatively remote cabin in the Upper Peninsula, which has been my retreat from the downside of success. I know success is better than the long period of time we lived in Leelanau County on 10 grand a year, but there are specific drawbacks, mostly the loss of privacy. I admit my mental discomfort when we nearly sold the farm before it was listed, but then the events of September 11th entered nearly everyone’s life, and there was an extended cautionary period, and we even wondered how much leftover life we might have left to live in a way that was pleasantly familiar. And mental quirks arise during insomnia. Should I tell a buyer where the morel mushrooms collect in patches in May? Should I make a phenology of the arrival and departure of birds including the approximate dates when the blue and green herons, even a rare sora, arrive at the pond near the gardens to eat that year’s crop of frogs, or where I saw groups of wild turkey and deer staring at each other during an August dawn? But maybe where we have lived so long is lovely enough that any new occupants should have their own voyage of discovery. On thousands of walks throughout Leelanau County I learned my own life. Looking at the Manitous on a winter walk is worth any self-help book save the Bible. Over the years I have noticed how many people moved up here because this is the area that they so happily vacationed in when they were young. That’s what happened with our daughters. Every summer when they were growing up we’d vacation in Montana to visit friends and to fish, and the state became our daughters’ own dream of carefree possibilities. Despite how strong the spirit of this place in Michigan is within me, simple human, family affection takes precedence over everything else in life. This is a simple fact of life rather than invented wisdom. Readers might be careful where they take their children on vacations if they’re unsure they wish to end up there.